SEO, or search engine optimization, is key to driving traffic to your website and business. This is incredibly important, after all, what’s the point in spending all that time and effort on creating a brilliant website, if no one’s ever going to see it. You can’t just rely on users finding it by chance, this just won’t get you anywhere. You need to make it happen. Blogger outreach is basically the process of asking bloggers to write guest posts, featuring or reviewing your products or services, to get you exposure. 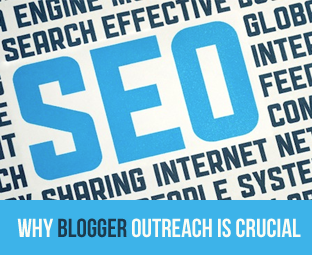 In this article, we will show you 5 reasons why blogger outreach is crucial for SEO. Links are of tremendous importance to SEO. Search engines love links. Having external links helps search engines find your site, so you want as many as you can get. This will help get your site higher on the search result pages. When a blogger writes about you, they will link back. Their visitors may then share their post, or link back to it in their own content. Blogger outreach is a fantastic way of building external links back to your site. Content is very important. SEO isn’t all about keywords anymore. High quality fresh content is not only important to your SEO, but also to keeping people coming back to you. Why not use a blogger outreach program to get bloggers to write articles for you? People don’t return to view one page repeatedly. Regular updates keep people coming back. High quality content will have people checking back for your next post daily. Bloggers can have an enormous influence on their readers. They build up relationships with the people that view their blogs, and there’s a loyalty and trust between reader and writer. A good article from an influential blogger can increase your own visitors massively while also building your own reputation and customer loyalty. Building relationships with bloggers is great for your SEO. Build-up relationships with them. Don’t make it all one way. Share and comment on their posts. Make sure they want to work with you, and value you as a contact. This relationship could help you not just now, but in the future. People in an influential position will be there to turn to for help whenever you want to give your SEO a boost. Blogger outreach, can help you reach a much wider audience. You’ll be exposed to not only your target market, but anyone that sees the bloggers' posts. Social shares are an effective way of spreading content and getting seen online while improving your SEO. We are always looking for easy ways to improve our SEO. Blogger outreach allows you to do just that, without a whole lot of work on your part. It can help you increase traffic, sales, good reviews and you may even meet some bloggers along the way that can help you for many years to come. If you are a small business, looking to build a great reputation early on, Blogger outreach is an easy and effective way to help your company with much more than just SEO. Why not contact Enterprise SEO to help you set up an outreach plan?